I used these around my fountain and they are fantastic! Didn't think these would do anything this year but they have the most beautiful color. Beautiful plants. Love lilies so much. They are indeed the fairest of them all. Dwarf Crested Iris this is low, but rapidly, growing member of the Iridaceae family features fragrant pastel blue or lavender flowers. Tolerant to deer and drought, it grows well in zones 3 to 9 and prefers full sun to part shade. Its mature height ranges from 3 to 6 inches with sword-like leaves. This perennial is perfect for rock gardens, forest edges, or in a bed. It can also make a lovely pop of color as ground covering or to edge sidewalks. 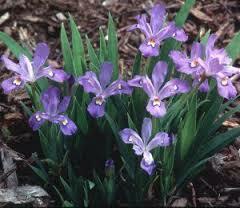 Dwarf Crested Iris has a beautiful and pleasant aroma. These great plants can be created into beautiful and fragrant lotions and deodorants for women. They can also be transformed into essential oils that can be used in infusers to relax after a very stressful day. 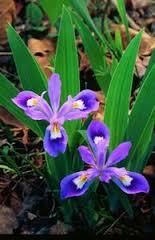 Dwarf Crested Iris is a perennial and is native to the eastern United States. They have 2-8 cord-like branches. The leaves are brown and sickle-shaped. These plants supply lots of beautiful color to all gardens and also work great to create decorative borders for walkways and driveways. They grow in a clumping form and has several blooms to each clump. They usually bloom from April through June each year after they are planted. They love to be located in areas that supply them with moist and well-drained soil conditions. They provide gorgeous purple blooms that are rather small compared to other iris flowers but are still spectacular. The petals have a view as they have been painted white and dark purple. The leaves on this plant are long and slender. Once these beauties are finished blooming, they can be separated and added to other areas of the garden or natural area. These plants are both natural caring and are very popular when it comes to creating beautiful flowering garden areas. These plants can also be found growing in wooded areas where the soils remain moist year round. They are beautiful when blooming and brings life and color to all fields. They are an excellent choice when it comes to having beautiful flowering plants that do not take a lot of work.